I'm a new owner of a used '13 SV and new to the forums, here is my 1st post. I have searched and could not find any references to this relationship. 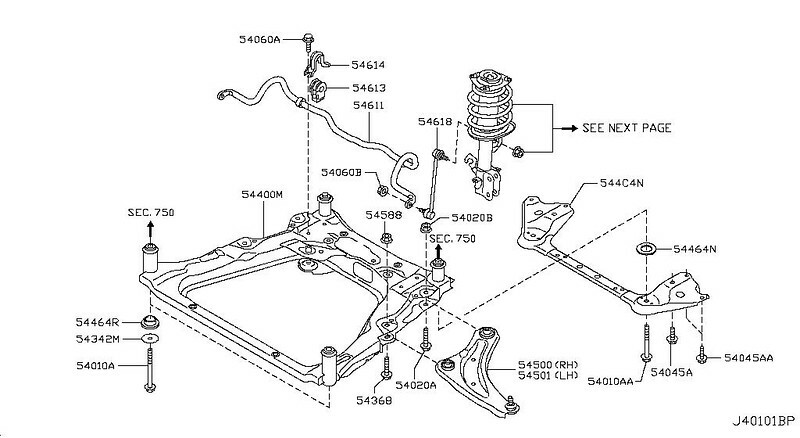 The Nissan Leaf part codes for the major suspension pieces match those of the Nissan Juke. Sure the part numbers are going to be different since the vehicle weight and comfort tuning are going to be different. Or are they different? Many are NOT. The big question: Can we can apply Juke (fwd) aftermarket pieces to the Leaf?!?!? Rear suspension beam | part code: 55501A I'm betting the different part number for the Juke is due to the size of the swaybar inside. Front wheel drive tuning usually involves decreasing the understeer. So folks increase the roll stiffness of the rear with a bigger swaybar or higher spring rate. Some increase the front grip with more camber and/or less front swaybar (or less front spring rate). Last edited by Eggroller on Thu Feb 23, 2017 10:39 pm, edited 3 times in total. Juke parts which could potentially fit the Leaf. All are FWD version of the Juke. Lowering springs with new bumpstops for rear shocks. Part number: 54000-RNF50. Fits Juke 2011 to 2017. Lowering springs. Up to a 1.5” drop with a slightly raised (5%) spring rate. Part number: TNF157. Front Spring Rate: 2.1 kg/mm | Rear Spring Rate: 3.4 kg/mm | Front Drop: 1.2 in. | Rear drop: 1.5 in. Lowering springs. Part number: 63104.540. Front: 1.2 in | Rear: 1.2 in | Tested With Factory Dampers. Camber Bolts 14mm. Part number: 5.81260K. Camber +/-1.75 Degrees Of Adjustment. Last edited by Eggroller on Thu Feb 22, 2018 10:30 am, edited 2 times in total. If you are planning to rip-out the OEM stuff from the Leaf, why re-select OEM parts once again (from the Juke)? If you are going through all that labor cost/trouble, just go with the best aftermarket suspension parts, right? It's a bit of effort (man power) to work on the suspension, so you'd want to do it right the first time around with the best aftermarkets installed. Nice find Eggroller. I didn't even think about the Juke, but while looking through Nissan parts drawings I came accross '07-'13 Nissan Versa has very similar suspension to the Leaf. I bought a set of Versa springs to mess around with and attempt to lower my Leaf. mxp, depends on what you are looking for. Used OEM parts can be had for pennies on the dollar for instance. Also OEM parts are engineered and built to a much higher tolerance than a lot of aftermarket parts. For me, I want OEM springs because I want an OEM ride, but lower ride height. mxp wrote: If you are planning to rip-out the OEM stuff from the Leaf, why re-select OEM parts once again (from the Juke)? There is a stronger aftermarket support for the the Juke. Buy the parts from the Juke install on the LEAF. Since the part numbers are the same across the board. We have a suspension system built for the 2900 lbs Juke on a 3300 lbs Leaf. No wonder it is soft and roll-y. Eggroller wrote: Since the part numbers are the same across the board. We have a suspension system built for the 2900 lbs Juke on a 3300 lbs Leaf. No wonder it is soft and roll-y. I do not think the parts are actually the same between the cars, just similar design and same part numbers. The Versa also has the same spring part numbers but they are different. Also I noticed a Nissan Titan has the same part numbers for the large components even though they are obviously different. Still aftermarket Juke parts might be a good match, or those Nismo Juke parts sounds like they might be the ticket. Anyone friends with a Nissan tech? Can we confirm any of this? Lower suspension would increase aerodynamics which increases range. Plus, the leaf is ridiculously 'tall'. I think it could use a 1" drop. While we are on the topic of suspension, has anyone ever weighed the wheels & factory tires? 17" wheels seemed strange over a lighter 15 or 16" option. Juke Nismo springs and struts on ebay for $399 or best offer. Someone should get these and report back if they lower the car or change the handling. I would but I need to try my set of Versa springs first. VitaminJ wrote: Juke Nismo springs and struts on ebay for $399 or best offer. Someone should get these and report back if they lower the car or change the handling. I would but I need to try my set of Versa springs first. Not gonna throw away $400 on used parts that we don't know for sure will work. We need to talk to a Nissan technician that has worked on both and can tell us if they are interchangeable. Deathwater wrote: Not gonna throw away $400 on used parts that we don't know for sure will work. Firstly, it wouldn't be throwing away anything, if they don't fit put them back on ebay. Secondly, Eggroller's research is sound and parts commonality is 99% certain. I did the same research on Nissan Versa parts and came up with the same answer, bought the parts, and am waiting for spring to install them. They are sitting on my shelf. I have measured the Versa springs with a caliper and they will fit as if they were engineered to fit. The only uncertainties are A) what will the ride-height be and B) the handling. If A is too tall, that's easily solved. Otherwise, back to the drawing board. As I said before I didn't even think of the Juke but now I am kicking myself. A Nissan technician is probably the 3rd to last person I would ask. No offense to any Nissan employees personally, but car dealerships of any make of car are bottomless pit of despair.